First on-site huamanoid (robot) in India, was launched by the Kumbakonam-based City Union Bank (CUB) in Chennai, Tamil Nadu. 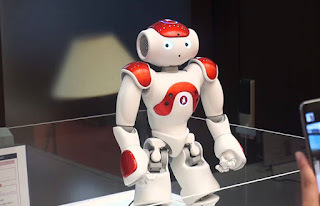 Humanoid named 'Lakshmi' is India’s first banking robot.Currently, CUB has readied only one version of huamanoid banker and but is planning to deploy 25-30 robots at key branches by end of year if Lakshmi proves a hit with customers. Lakshmi is artificial intelligence powered robot. It can speak English, gesture and engage in a life-like manner in conversations. The robot can interact with customers on more than 125 subjects including account balance and interest rates on loans. It will not voice the sensitive financial information like account details rather display it discreetly on its screen.